Southern China is now the major centre for making chip-on-board (COB) electronics. And DIY Electronics is the only supplier that we know of that is supplying these items to the public in general & the hobbyist in particular. We have put together a range of these items. If you are interested to buy these or similar items in bulk then please email us with your requirements. COB means that the very small die form of the IC is bonded directly onto a PCB and the copper tracks come out from it. A blob of black epoxy covers & protects it. The benefit is a saving in space. We are buying these COB's on larger than usual PCB 16mm x 29mm, so that the student can solder the external components to it with a minimum amount of difficulty. They were reviewed in Electronics Australia, April, 1995, p72. SG1 through 14 are COB Kits which give a sound of some sort. An 'M' suffix denotes that the Kit comes with a mother-board to support the COB PCB and components. You can view a scan of the motherboards below. Imitates real phone tones, engaged and ringing sounds, two door chimes. COB PCB: 16mm x 29mm. Mother board supplied to fit COB PCB & components into. 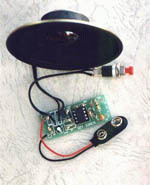 Melody IC in TO-92 package. Just connect 3V and speaker. Tune repeats continuously while power is connected. Total of 128 notes. Cmos LSI. For Alice tune. SG10M 4 animal sounds. Same motherboard/COB as SG1M, just the sounds are different. Hen, cat, cow and dog sounds. Just 4 switches and 4 components to add. Ideal for schools. Supplied with motherboard. 18mm x 15mm COB contains a standard siren driver as found in piezo horns and toys. Drive circuit will tolerate a wide range of components values. 2V to 5V operation. "Three Christmas Carols" Same as SG7 & SG13 but three Christmas Carols play. A surprisingly loud siren for such a simple circuit. Uses voltage controlled oscillator. 1/2 Watt, 8 ohm speaker supplied. 9V operation. Ideal to attach to an alarm system which needs an sound module. Powerful 6V to 12V piezo alarm. Uses 556, auto-transformer and two piezo alarm elements. Circuit will deliver over 110dB at 1 meter. Uses sweep circuit so there is no need to trim the circuit to match the cavity resonant frequency. We supply a plastic box with two piezo elements (35mm diameter) already mounted in their own resonant cavity. This is part of a commercial alarm unit but it uses our (better!) drive circuit. Ideal alarm unit for Kit 53 (Codepad/Burglar Alarm). 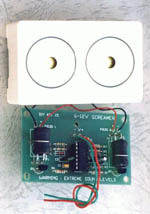 Driver circuit for 8 ohm horn speakers. Based on the Zetex ZSD100 siren driver IC. 4V - 18V. 120dB of sound.